Home » SMARTPHONES » ANDROID » Xiaomi Mi 7 all new features never seen before coming soon. Xiaomi Mi 7 all new features never seen before coming soon. Bored of using same UI on Mi, However after new MIUI 9 update, Redmi has added some new cool features on Mi phones. But Mi 7 is going to be a complete different experience ,rumors are it will be very identical to iOS or may be Oxygen. After the release of Redmi Mi 6 on 2017, April, Redmi is ready with their all new UI and functions enriched Mi 7 in the mid of next year. The phone is speculated to be bezel-less display to counter recently launched mid-ranged B-L phones. Xiaomi Mi 7 Features and Specifications. 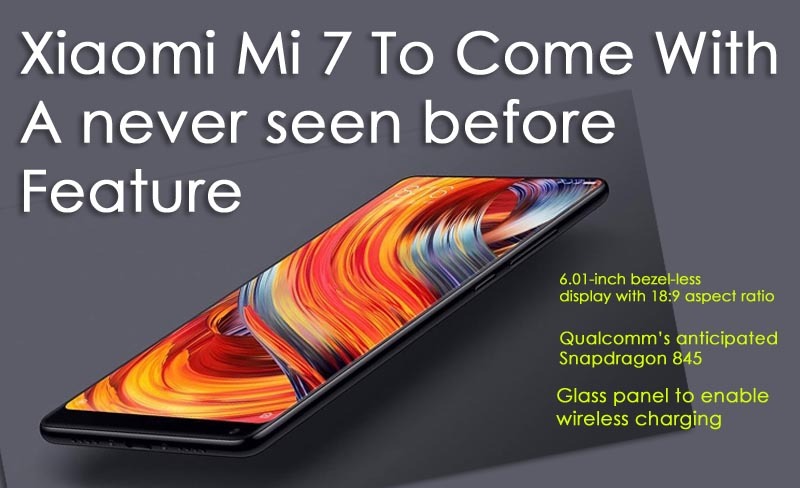 ♦ The all new Xiaomi Mi 7 is rumored to be featured with a significant 6.01-inch OLED display aspect ratio of 18:9 and 1080 X 1920 Pixels resolution. The phone will run on Qualcomm’s 845, the most anticipated processor SoC. ♦ Xiaomi Mi 7 will feature a dual camera setup on rear with resolution of 16 MP ,f/17 aperture providing to be a better photography experience as compared to Mi6. ♦ Camera will be enriched with some awesome never before features in Mi series like, enhanced Bokeh mode along with optical zoom facility. ♦ The device will come with 6GB RAM with an expandable capacity upto 64GB via MicroSD. ♦ As per the battery of Xiaomi the all new Mi 7 will contain same power capacity of 3350mAh, as its predecessor. ♦ Xiaomi is planned to introduce Xiaomi Mi 7 with a complete glass panel to make it Wireless charging enabled, with incredibly beautiful ceramic back. ♦ The price may be quoted as CNY 2,699(26,500 INR approx). The phone will be introduced in China, Xiaomi’s homeland and later on, worldwide.